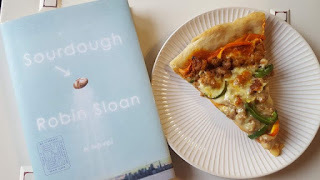 It seems like just last week that I posted the announcement for Sourdough by Robin Sloan as the August/September Cook the Books selection. I cannot believe it is now October and time to post the roundup. Some loved the novel about robots, sourdough, mysterious immigrants, and farmers market. Some found it a bit weird. Regardless, I hope everyone had fun making yeasty or bready or spicy dishes. Wendy (A Day in the Life on the Farm) was the first to post up with a delicious appetizer. Wendy thought it wasn't the best book she's ever read, nor was it the worst. :) She pulled her inspiration from the Lois Club, a group of women who basically only get together because they share the same name. "I reached back to when Lois presented her first loaf of bread to her Lois club. ( I wonder if there is a Wendy club?) 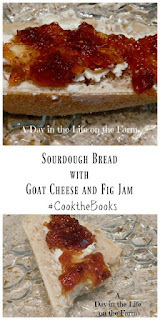 and served it up slathered with goat cheese and figs." Wendy, if you form your own club I would love to crash the party, especially if you are serving these appetizers. Amy's Cooking Adventures was next up with her own homemade sourdough bread. Amy found the book "…shall we say…interesting?" She "really had a lot of trouble relating to the main character, Lois, and the whole Mzag storyline. But the sourdough bread – now that was inspiring!" 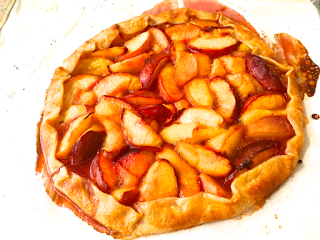 Cathy from Delaware Girl Eats went in a totally different direction with a rustic peach and nectarine tart. How did she get that from Sourdough? The lead character in the novel Sourdough, named Lois Clary, encounters the character Charlotte Clingstone in her search for the roots of her Mazg sourdough starter. In fact, this lovely novel is all about searching - for true self as well as true starter. Clingstone clearly is modeled after Waters - from her California wild-child past, to her eponymous Berkeley restaurant Café Candide, to her devotion to garden fresh food. Not to miss either is her name, synonymous with a type of peach. So the connection between Alice Waters, the Sourdough character and peaches isn’t much of a stretch at all. Glad you went in this direction, Cathy, and it is not much of a stretch at all! Culinary Adventures with Camilla did one of my new found favorites, Sourdough Avocado Toasts. Camilla read the book twice, trying to like it each time. I'm glad she was inspired to make these toasts. Terri from Our Good Life found the book a bit odd. "The food is magical, and thus the book digs into the land of fantasy, starting slowly and then jumping off the cliff talking about bacteria and other tiny creatures." 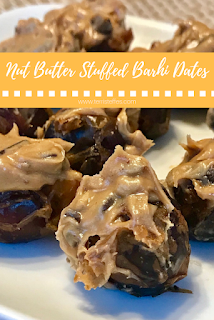 That didn't keep her from creating these delicious bites, Nut Butter Stuffed Bahri Dates. Terri, these nutritional bites would be much better than Sloan's slurry! I posted up next with a yeasty element, Sourdough Pizza with Local Toppings. I wanted to keep it local in honor of the farmers market angle. I was also super excited that I was able to keep my sourdough starter alive! I was struck by Clingstone’s challenge to Lois regarding her robot making pizza dough. I know it’s not exactly a robotic arm, but I was glad to use my stand mixer and the dough hook to knead the dough. CTB co-host Simona at bricriole warns us not to think our sourdough will behave like Lois' (at least we hope not). Simona whipped up some elegant Sourdough Whole Wheat Crackers. Simona is no stranger to sourdough. I have baked various types of sourdough bread (pane al lievito naturale) and this time what got me scouting for recipes was the idea of using the starter in between feedings that would otherwise be wasted. 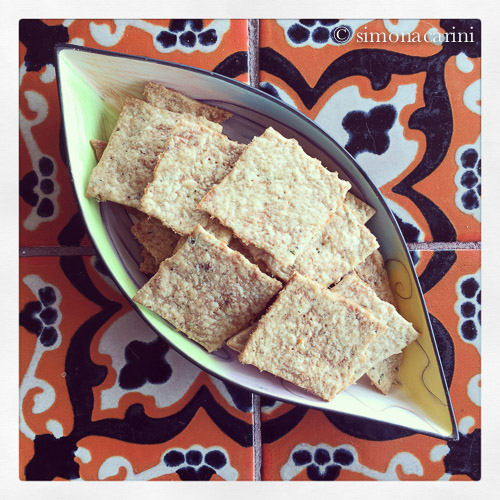 I found inspiration on the King Arthur Flour website which has a recipe for Sourdough Crackers, made particularly appealing for the inclusion of whole-wheat flour (farina integrale). Your resourcefulness would be appreciated by those at the Marrow Fair. 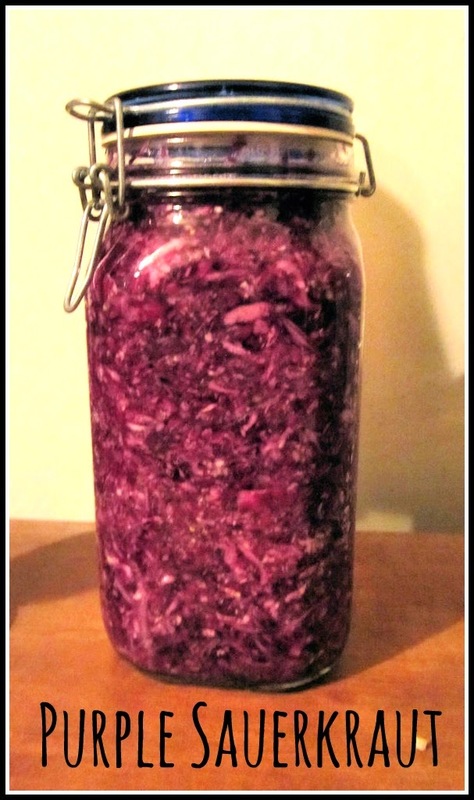 Lynda at Reviews, Chew, & How-Tos went in another fermented direction with Simple Sauerkraut. 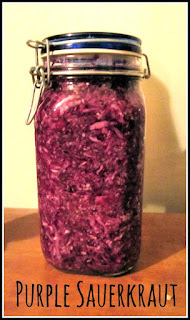 I'm glad that she made this sauerkraut, part of the Great council of fermentation: “Beer. Sauerkraut. Kimchi!” (210). I was so hoping that someone would tackle the Double Spicy from the brother's illegal pop-up restaurant. Co-host Claudia at Honey From Rock did just that. I was intrigued by that idea, of making my own Spicy Soup, using tangy ingredients from our garden. Maybe kaffir lime leaves, galangal ginger, curry leaves and basil, along with others of the usual suspects: garlic, onion, chili peppers. 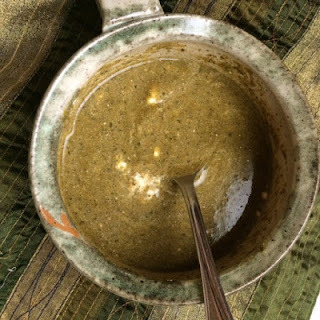 I started by tossing spices into a pot to temper, then added ghee and sauteed, an onion, tossed in garlic, then the leafy herbs and galangal, all minced well. Now some veggies went in: a carrot, shitake mushrooms, and later in the game, sweet potato greens and Pacific spinach (you could use your favorite greens). Just toss a few minutes over medium heat. Finally added in my homemade stock, and simmered until all vegetables were done. I added about a cup of coconut cream, salt, pepper. More chili. Got to Taste. Taste Taste. This was a culinary experiment with a theme. 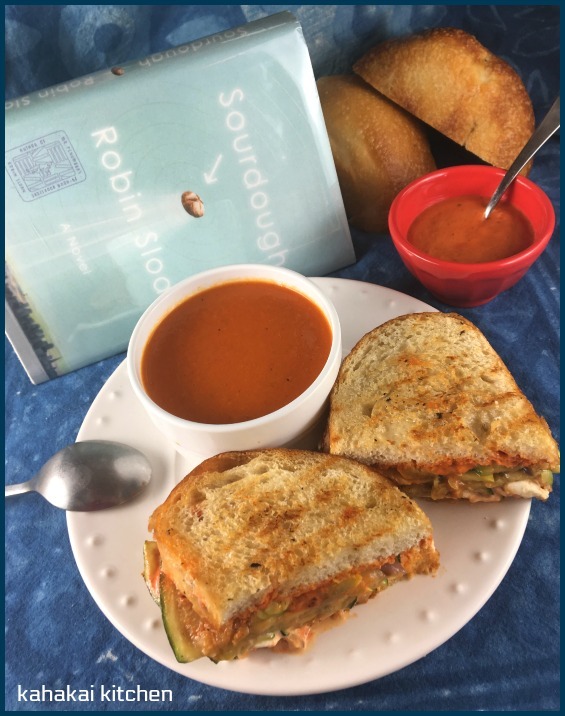 Another CTB co-host, Deb at Kahakai Kitchen, did her take on the Double Spicy with her Combo (Double Spicy): Spicy Red Pepper-Tomato Soup and Grilled Veggie Sandwich with "Secret Spicy" Sauce & Burrata. Deb listened to the audio book as well as read the novel. She found herself immersed in the novel's "unique premise that combines and explores bread making, finding your passion, and the San Francisco food and high-tech scenes." 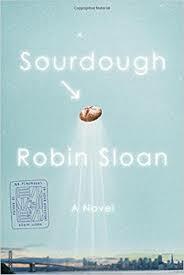 Sloan's vivid writing made me want to smell the bananas in the Clement Street Starter, taste the green Slurry nutrition drink, and hang out in the mushroom grotto at the Marrow Fair. Overall, an entertaining book that slyly looks at food--and food crafting and food automation from the perspectives of those who live to eat and those who eat to live. Thanks to all for participating and for these inspired recipes. 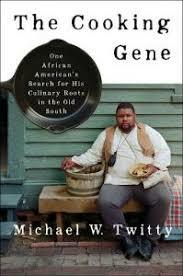 For the October/November round, Simona is taking us back to reality with The Cooking Gene by Michael Twitty. Look for an announcement post here soon. What a fun collection of posts! I see some recipes I need to try! Beautiful roundup! Once again my jaw dropped at seeing the variety of recipes contributed. Thank you for hosting, Debra, and for the roundup. On to reading the posts. Great pick and round-up Debra. I started Mr. Penumbra's 24-Hour Book Store but couldn't get into it really and didn't finish. This one I thought was terrific, just loved it. Thanks so much for hosting. One of the things I love about this book club is that it opens up new genres for me. 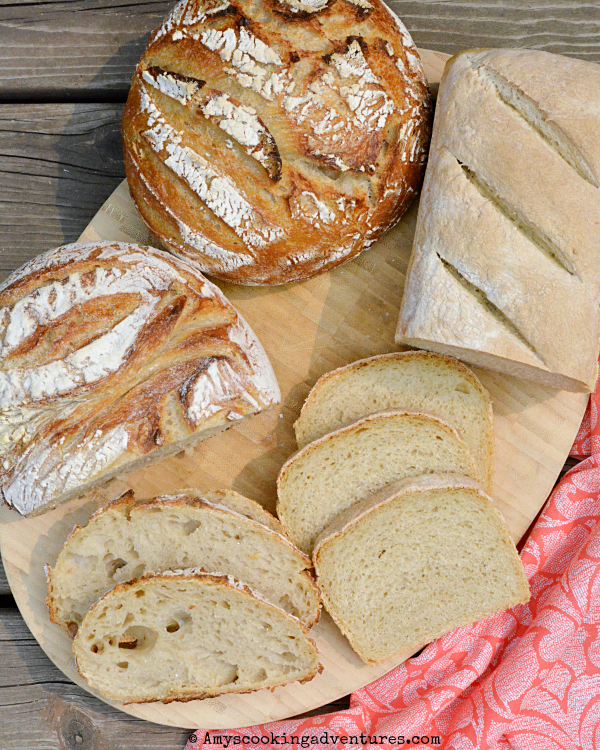 This was such a great round up - I love the variety of Sourdough-inspired foods here! Thanks so much for hosting! It indeed was a quirky book and I was delighted in the different directions folks took their inspired posts. Thanks to everybody!